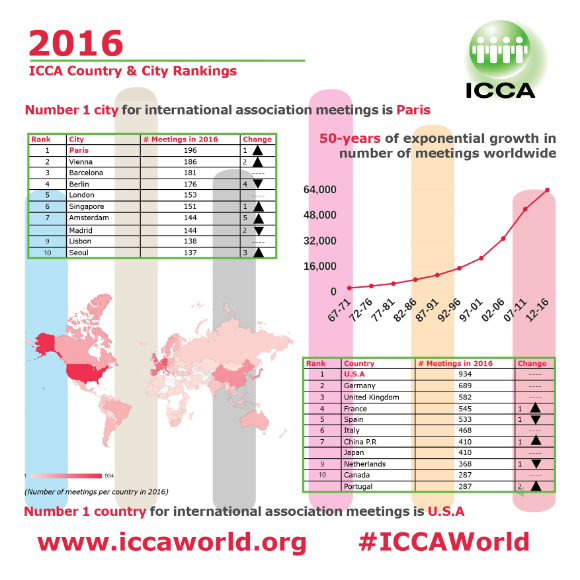 Whilst these ICCA rankings provide some evidence of a city or country’s relative performance, it is only when all data on all the meetings taking place in a destination are considered – corporate, intergovernmental, non-rotating, etc – that a true, complete picture can be seen. ICCA always advises its members to collect their own statistics on all meetings they organise, and provide a full picture on their performance. This entry was posted in Breaking News, Corporate Travel & Incentives, Meeting Community, Travel Tips & News and tagged association, association meetings, city, countries, country, destinations, ICCA, meetings, rankings.